A recently discovered page on TI's Education website has revealed new details on the interface and abilities of their upcoming color-enabled addition to the TI-8x line. The page includes guides for two classroom activities: "Coin Toss", and "Independence is the Word". Both guides include a number of screenshots, revealing details about the UI. We've featured several of them below. 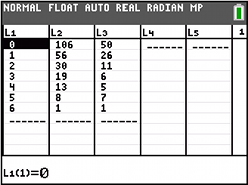 Additionally, one of the guides comes with programs to download to your calculator, package in .8xp format. It is not yet known whether this will include new tokens or commands. We have examined the published .8xps, and found them to offer neither any new tokens nor any changes to the .8xp format we know and love. 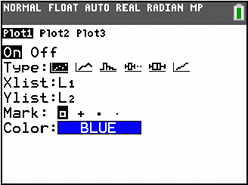 That said, we anticipate the possibility of new commands to support color in TI-BASIC. One evidence for this is the presence of colors for altering graph style seen in several Y= Editor screenshots. The 84+CSE page also says "More info to be released in January, 2013". I wonder if we'll be getting any info on a definite release date, especially since they'll be holding activities teaching you how to use them coming up pretty soon. I can reveal that there will indeed be a press release coming out in a week or so; until then there's not much I can reveal. Nice find though, Elfprince13! Fascinating stuff. Hey Kerm, how do you know so much (seemingly) inside information? I can't say. Surely you could predict that sort of an answer. But let's focus on the news at hand. Here are some screen shots of a simple game I wrote for the 84C to test App writing. It's a rework of an old 83+ App I had written a long time ago (PEDE - I had posted it on ticalc.org a long time ago). It's a crude version of the old Centepede game. I added color and updated the characters size and shapes. Nice! Is this with a real TI-84+CSE? If so, how did you get your hands on one plus the SDK? Or are these mock-ups? If you get a chance, please also Introduce Yourself. Edit: Whoa, it's Pat Milheron! Welcome to Cemetech; it's an honor to have you here. I renew my request that you introduce yourself given that; I certainly hope you enjoy your stay. Are you able to provide any info about how things are drawn to the screen? Okay I'm also pretty curious about how you took the screenshot. SDK comes with emulator? I am also interested in how ASM/APP's interface with the LCD, and what modes the screen supports (palettes, variable bit-depths etc). Centipede looks great! 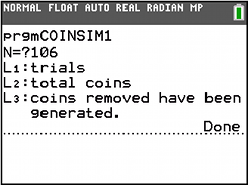 There's a program called SmartView, which is TI's version of a calculator emulator. I can publicly say that they're making a TI-84+CSE SmartView, since they already announced that themselves. I have used SmarView on Mac. It is slow, and doesn't give me the same debugging capablities as Ti83+SDK's emu or Wabbitemu does. I'd have to buy it to get a better version, and it is quite pricy. I thought SmartView didn't run ASM? © Copyright 2000-2019 Cemetech & Christopher Mitchell :: Page Execution Time: 0.113171 seconds.